Inspired by the classic Walt Disney animated movie Sleeping Beauty come the Disney Traditions Sleeping Beauty The Spell Is Broken Statue. This statue recreates the classic moment when Prince Phillip bestows true love's kiss upon the Aurora to break Maleficent's spell and reunite them forever. The statue is beautifully crafted by Jim Shore with his signature combination of unique color palette and meticulous handcrafted attention to detail. 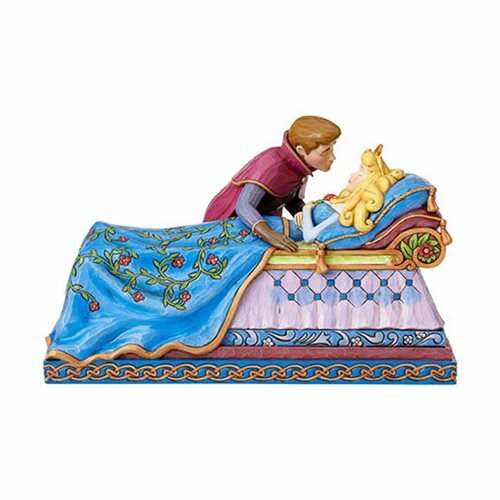 The Disney Traditions Sleeping Beauty The Spell Is Broken Statue is made of stone resin. Measures about 10-inches long.